Sometimes food can be your palette! I've talked a little bit about writing as two processes — writing and editing. I'm going to unpack that a little bit. The writing phases are not only creative. Aside from grammar, there is another analytical side to it. The trick is keeping it all in balance. Let me explain. When we edit our work, we try to get out of creative mode so we can look at our work from the perspective of grammar and spelling. But for all of the other stages, we want to hang onto the creative brain while applying analytical processes. This sounds a bit strange. I know. But stay with me! If you get this, it will make a huge difference when you create content. Whether you are writing non-fiction blog content, or working on a creative piece such as a short story or novel, you want to use your creative brain. I believe the muse lives there. Writing begins with an idea. Sometimes we have to stimulate that using either creative or analytical tools. These tools may help you. Choose those that resonate with you. Collecting ideas:Keep a pen and paper handy at all times and write ideas that come to mind during the day. Collecting questions from clients: This one is self explanatory. Each time you write a post, ask a relevant question. Invite questions whenever you can. SEO research: Once you have your keywords, they will inspire ideas for writing. Free write: A free write is a good way to switch on the creative brain. I always feel the switch. (Do you?) In this mode I am more likely to make grammar errors, but that's okay. I'll fix them later. I am more likely to come up with ideas that are a little different, such as allegories or talking garden plants. Here is one way to do a free write. Set a timer for 10 or 15 minutes. Begin writing anything that comes to mind — no rules. If you are stuck, look directly in front of you and write what you see. Keep writing that over and over again until something else comes to mind. Walk in nature with pen and paper until something comes to mind. Do other types of creative activities: Any creative activity will help you switch on the creative brain. Try painting, drawing, crafting, singing, playing an instrument by ear, etc. Any of the activities in Drawing on the Right Side of the Brain by Betty Edwards are good to use. Play with your child's play dough. 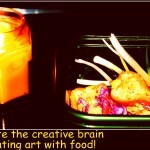 Make a pretty lunch or dinner using food as an art medium. Write a poem. It doesn't have to be a masterpiece to work! After your creative brain is switched on, look at a list of ideas for your blog and begin to write. In this phase, don't worry about anything at all — grammar, organization, spelling, etc. For more detail on this, check out Tools to Help You Start Writing. This is similar to a free write, except that you have a focus. In this phase of the process, your brain begins to merge the creative with facts and data. It's a messy phase so don't look for perfection. If you let the analytical mind in, it is like trying to pull in the fish before it's been hooked. The fish will get away. You've activated your creative brain. Don't send it packing! At this point, you have the tools and you have your material. Remaining in the creative brain may be difficult. If you feel it drifting away, do something creative momentarily. One thing that may help is to print what you have so far and use colored pens and markers to make arrows to move text. Doodle in color for a few minutes. Then when you move to Word or your WordPress edit box, you've already done some of the work with the muse. In the final stages of writing, try to keep the spark awake. Even during the editing phase, you want to have a little bit of creativity humming in the background. Is it a sentence fragment? Listen to it with the creative ear. Is it stylistically beautiful? Does it make a point or have an impact written that way? You may want to leave that fragment as is if it makes sense, makes a point, or adds to the beauty or humor of your piece. Keeping both sides of the brain working at the same time can be challenging, but it often leads to better writing. I'm curious to know if you sense the switch to the creative brain. Please tell me about it!